Whether Being There is an indictment of our narrow view of the world, a celebration of empty-headedness or all of the above, "Life is a state of mind," and Ashby's film is a gift to treasure. 130 min. United Artists Films. Director: Hal Ashby. Cast: Peter Sellers, Shirley MacLaine, Melvyn Douglas, Jack Warden, Richard Dysart. Peter Sellers' career-capping performance--released only a year before his death--carried a poetic significance for his career. The role of blissful simpleton Chance the Gardener reflected Sellers' own blank-slate ability to receive and express a widely varied collection of characters (Sellers once claimed, "To see me as a person on screen would be one of the dullest experiences you could ever wish to experience"). The much awarded performance received an Oscar nomination; some say he would have won the Oscar and yet more awards if the film hadn't been released with end-credit outtakes that "broke the spell" of Sellers' serene character work. Being There is significant in several other respects. Even in the '70s, the oddball project was seen by studios as fatally uncommercial; only Sellers' comeback as Inspector Clouseau won the film a greenlight. It's one of only a dozen features by Hal Ashby (Harold and Maude, The Last Detail, Shampoo), a beloved icon of '70s cinema. Shirley McLaine, Melvyn Douglas (in his second Oscar-winning role), Jack Warden (doing his best dry takes), Richard Dysart and Richard Baseheart fill out the ensemble; Johnny Mandel supplies the score and top DP Caleb Deschanel the photography; and perhaps most importantly (and most unusually) author Jerzy Kozinski was allowed to adapt his own novel to the screen. Chance has lived a life in isolation as the gardener at a Washington, DC townhouse. When his benefactor (perhaps his father?) passes away, Chance finds himself thrust into the outside world for the first time in his life. His only experience of the world has come from his time in his garden, puttering around the house and watching television. Out on the street, he puzzles over the failure of his remote control to change the channel of his reality, but "lucks" into a pedestrian accident with a town car. The occupant, Eve Rand (McLaine), insists that Chance return to her mansion, where he meets ailing "kingmaker" Ben Rand (Douglas) and the ever-present family doctor Robert Allenby (Dysart). The Rands' open-ended invitation to Chance pays repeated dividends to all involved. The perceived wisdom of his gardening "metaphors" impresses both Rand, who admires his "admirable balance," and the man he advises, the President of the United States (Warden). Soon, Chance the Gardener (misheard as "Chauncey Gardiner") is a celebrity spreading accidental wisdom on talk shows and influencing national policy. His accidentally escalating power turns out to be an aphrodisiac to Eve, who coos, "You're so cool and detached." Unfortunately for Eve, Chance is an eternal boy, a TV junkie capable only of mimicking adult behavior--and tending flowers (Eve's embarrasing attempt at seduction is counterpointed by Mr. Rogers on the bedroom TV). The more Chance says, "I understand," the more the audience understands that he doesn't. The philosophical dramedy spins gold from what is often chaff: the notion of a simpleton as the potential answer to society's ills (see Forrest Gump, Sling Blade, etc.). Being There stands apart by inviting multiple interpretation: while one could take the film as a parable of the simplicity of peace and a portrait of an illiterate, mentally challenged man who walks on water because of his "gift of being natural," it's full of satire about how we see what we want to see and hear what we want to hear, the gullibility and numbing effect of modern sound-bite media, and the appeal of easy answers to complex problems. Chance's instant success renders the leader of the free world literally impotent, and the suggestion, at film's end, that Chance could one day be President is at least as horrifying in its implications as it is hopeful that his lucky streak might bring about peace on earth and goodwill to men. A lawyer huffs, "A third-grade level: that's what they understand," while Chance's former co-worker notes, "All you gotta be is white in America to get whatever you want." Above all, Sellers is terrific. He cuts a fascinating figure defined by bygone gentility and a radical simplicity that's refreshing and redolent of Voltaire's famous suggestion "We must cultivate our garden." Whether Being There is an indictment of our narrow view of the world, a celebration of empty-headedness or all of the above, "Life is a state of mind," and Ashby's film is a gift to treasure. 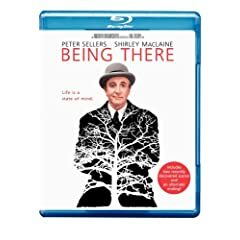 Speaking of gifts to treasure, Warner's Blu-ray debut of Being There (mirrored on DVD) will warm the cockles of the hearts of Peter Sellers fans. The next-gen transfer is a definite improvement over DVD. Though not perfect (DNR and edge enhancement result in some minor flaws), Being There hasn't looked this good in decades. The soundtracks won't thrill audio junkies, but the Dolby TrueHD 2.0 track makes the most of the original elements, and the Dolby Digital 1.0 track preserves the original mix: certainly they're adequate audio options for the low-key film. Warner has made an admirable effort to round up some bonus features for this nearly thirty-year-old film. "Memories from Being There" (14:48, SD) sits down Melvyn Douglas' granddaughter Illeana Douglas (an actor in her own right) to discuss her grandfather's work and what he shared of his friendship and collaboration with Sellers. Two "Additional Scenes" (1:42) include a lovely trimmed exchange between Peter Sellers and Shirley McLaine and an extension to Chance's observance of the basketball players (in the cut scene, he speaks up). The "Alternate Ending" (2:03, SD) is also a gem: a beautifully acted additional scene with Sellers and McLaine capped by a different but also effective visual metaphor. The "Gag Reel" (6:15, SD) mostly reprises the end credits flubs without the credits in the way, but tacked onto the bloopers is a larky segment of Sellers and director Hal Ashby talking directly to the camera in mock promotion of the film. Lastly, we get the "Theatrical Trailer" (2:44, SD). The footage from the vaults is a special delight, and the feature itself a classic getting a definitive presentation on Blu-ray. Available for a nice price, Being There on Blu-ray is a must for movie buffs. All site content © 2000-2019 Peter Canavese. Page generated at 04/20/2019 07:53:10PM.